The sharing economy is significant socio-economic trend and a fast-growing innovation opportunity. PricewaterhouseCoopers projects a 20-fold increase until 2025, reaching $674 billion. 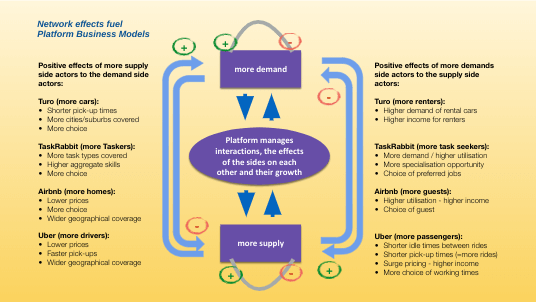 The platform business model is the most common way to innovate within the sharing economy. The platform business model must be considered the most important and revolutionary business model of the last decade or two. Google, Facebook, Alibaba, Uber, Airbnb, TripAdvisor, Booking.com, PayPal and many other of the most successful recent startups are built on this business model. 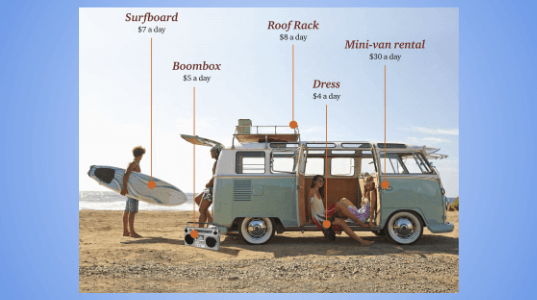 While almost all sharing economy companies are based on the platform business model, not all platform business models are part of the sharing economy: Uber and Airbnb are, Google and Facebook are not. There are an enormous amount of innovation opportunities where the sharing economy and the platform business model intersect. I am explaining both concepts separately and then in combination. Understand the details are and develop innovation ideas you can be proud of! Uber and Airbnb are the poster children of sharing platform businesses. But there are many more, wonderful sharing platform businesses that you have never heard of, from umbrellas, to food, to energy! The first wave of sharing platforms ended up not being successful. But with the success of GPS-powered smartphones came a second wave of wonderful sharing platforms that you can see here. The platform business model was underpinning the successes of the most successful start-ups of the last two decades. May it be pure platforms, such as Google, Facebook, Booking.com, TripAdvisor, etc or those within the sharing economy, such as Uber and Airbnb. 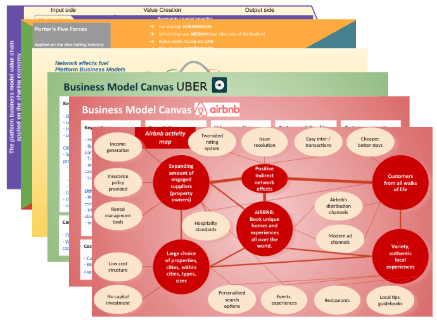 The underlying business model principles are the same. Learn about them in-depth here. Uber came out of the blue and made a big splash. They have attracted criticism and admiration alike. On which ever side you stand, you can't deny they have figured out how to successfully apply the platform business model onto the idea of the sharing economy. Find out about their business model in more depth than you will find anywhere else on the web. Now that you learned everything about Uber's business model, it is time to widen our horizons. Professor Michael Porter is the undisputed guru of strategy. 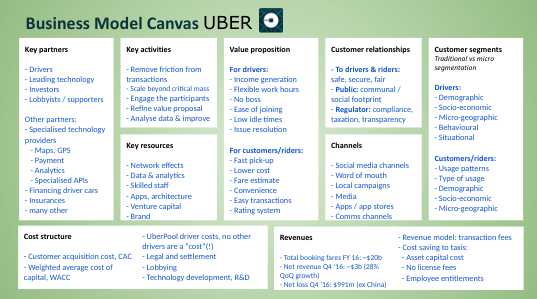 We are going to use one of his most popular tools, Porter's Five Forces, to analyse Uber's strategy in detail. 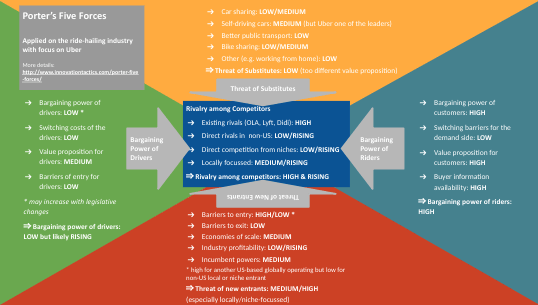 Understand Uber's strategy now. Airbnb is a source of abundant innovations. They started with shared accommodations but expanded from there to events and restaurants. They have made their footprint in a very tough industry dominated by big players like the Marriotts and Hiltons, the Booking.coms and Expedias. Learn about this amazing source of great ideas in depth. Another important strategy tool devised my Michael Porter is the activity map. 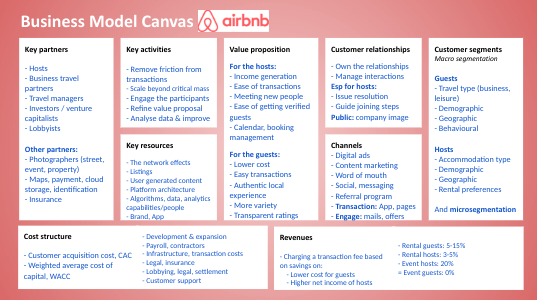 Among other exciting examples, such as TripAdvisor, Booking.com you can learn about how Airbnb amplifies their value proposition by aligning all their activities with it. 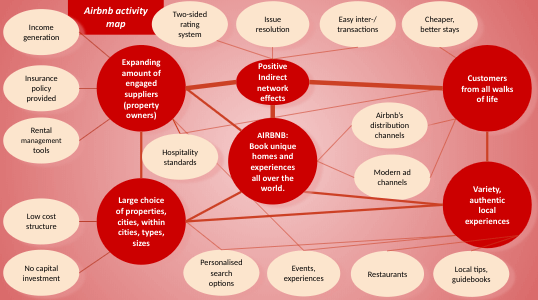 Jump into Airbnb's activity map (and other great examples). How do sharing platform businesses create value? We are looking at all steps of the value creation process. We are using yet another strategy tool, the value chain, to bring all elements sharing platform businesses together. This framework is ideal to brainstorm you ideas and play with various options of the individual elements. 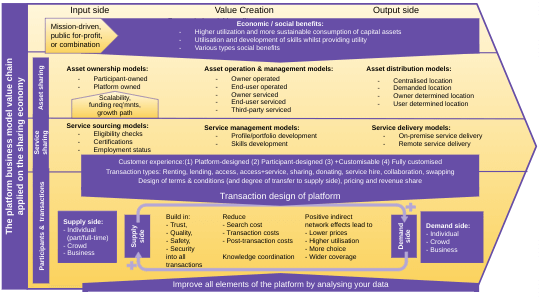 Understand the sharing platform business model value chain now. "Thank you!!! I have looking fir this information all my life. I recently graduated with a Master in International Hospitality Management and passed with a higher distinction but I never got this information. Interestingly, I enrolled for the course with the intention of getting this information you are offering for FREE." "Recently I came across a website innovationtactics.com and every night for the last two weeks I have been reading the blogs. My wife is now getting a bit annoyed but this site has been better than a new Game of Thrones season"
My readers are sharing their wonderful & creative platform innovation ideas with me from event platforms, hospitality platforms, styling platforms, promotional offerings platforms and lots of other cool stuff! Join the creative minds with a boost of innovation knowledge! You will receive all resources and my future articles. No risk. Easy unsubscribe anytime.